is one of my most favorite things! I have collected these eggs for years. A friend helped me take these awesome pictures. It is hard to see the scale but it is huge. I used limbs (branches are too small) from a tree in our yard. Our tree is filled with memories of places we have been and moments shared with friends. 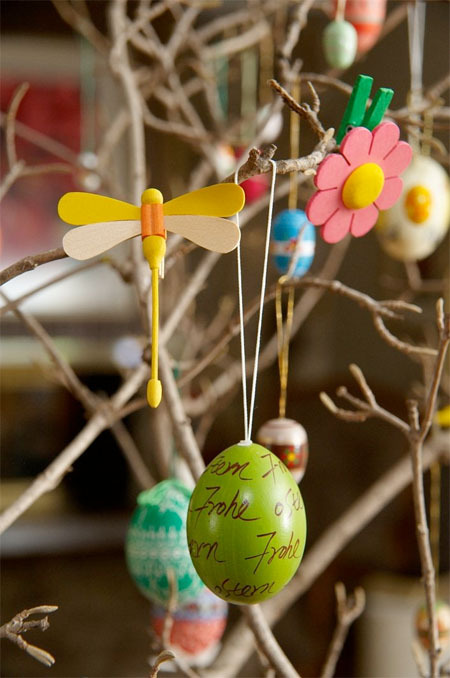 I am amazed with the skill of crafters all over the world to create these beautiful eggs and wooden clips. Many of the eggs are from Germany where our family spent five years. I collected real eggs from my baking n painted the eggs in my own designs n hung the eggs on a skeletal plant which was already in a pot. It was real fun doing it even tho it took a lot of time. I posted it on fb n my friends liked it very much as well as my friends who got to see it in reality. Someone thought a painted tree would look good. No an Easter tree should ideally have some buds, representing rebirth and the beginning of spring. I haven't put our decorations out yet but it always make Spring seem closer when we do. Easter eggs r exceptionally beautiful n r of paramount importance in certain cultures n I come from such a culture. this is stunning! Have always wanted to have one but couldn't fit this in my house! what a great idea! you could use the branches to decorate for each season. thanks for the idea! WOW what a beautiful egg tree! I'll have to remember that idea for next year. And since I've started writting comments today, thank you for the wonderful crochet patterns for the heart garland and the clover garland. I enjoy all types of creative outlets. I made these garland with some left over opal sock yarn ( in appropriate colors). They decorated my home and recieved many compliments. This is the first message I've ever sent!!! This is truly pleasing. I love the variety, and to display them on actual branches. It's inspiring to say the least. thank you. This is awesome! Had to post to my Facebook page!! Love it - so pretty. Makes me want to start collecting. this is stunning. After seeing it I went and made my own, thanks for the idea and I'll make sure I'll provide the link back to your site when I put up my photos today. That is so neat! So many pretty decorations! Isn't Germany where the egg tradition started? I remember in college reading something like that in a cultural anthropology class. Oh, what a beautiful tree! I take it you don't have a lot of boys pounding around your house, lol. I found you via UBP. Cute site! Ah but I do have those boys pounding about the house and a four year old girl obsessed with cartwheels --------it has taken many "gentle" reminders ha ha! Love, love , love your blog and will be back often. Hope you will stop by my blog for a visit. I am new to blogging and I am loving all my new friends. From the comments I have already received, it appears to be something a little different. I have been so touched by the comments that I have decided to give 2 boxes . They will be the $100 deluxe size. I really do want to bless people!!! I have decided that giving is life at its BEST. The drawing will be late afternoon on Saturday...wow that's tomorrow! That is absolutely stunning! You have an amazing collection and, of course, a great talent for arranging! Happy Easter! What a beautiful egg tree! man you are one crafty lady! You have such a beautiful blog too! I'm jealous! And sooo sad I missed your last contest! I may sign up for it now though.. hmmm, $6 doesn't sound too bad! I love the little eggs and the details on each. What a beautiful collection. Jen- Happy UBP! Found your link over there at the party!! Wow, what a really neat idea! I will definitely be checking back often, your blog is great! Have a wonderful weekend. Found you from UBP, great blog! Great idea's. So cute. I love it and cannot wait to come back for a longer visit. I love your tree. How wonderful it is to have many people who have given you a lifetime of memories. What a beautiful Egg Tree! I wish I could make something like that! Your adorable tree reminds me of the one my grandma had when I was growing up. When she pasted on my mom inherited all her homemade eggs. So wonderful. Love your tree, thanks for the memory. 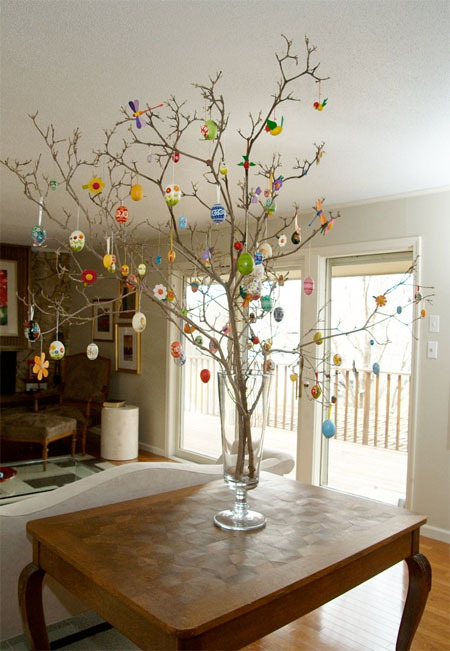 I am always awestruck by your fabulous egg tree! Just love it! I absolutely adore you're egg tree! How precious!!! Love it - What a FUN craft to do with the kiddos too! Thanks so much! Truly and lovely work of art .. the colors blend so well into your home decor and the tree branches are perfect for those little eggs and other ornaments! Love it! That tree is just beautiful. I love it. That is a beautiful tree. If you use real eggs and hard boil them they will keep and eventually the egg will dry up. Store in an egg carton and each year the shell becomes harder. Plastic eggs can be decorated nicely, too. Just beautiful and simple and lovely. How very meaningful. The clips are from an area in Germany, the Erzgebirge, known for nutcrackers and other beautiful wooden toys. Oh wow! I love it! We are just starting our Easter tree this year. I love the idea of collecting eggs from all over - so meaningful. Thanks for the inspiration! OH MY GOSH!!!! Love this.....i have to do this...that is beautiful!!!!! WOW! What a beautiful tree. Yet one more thing for me to work on for next year! LOL! I love that! I don't think I've ever seen Easter decor I liked before, but that is just fabulous. Gorgeous! What a lovely idea! This is such an awesome idea! Love the height and your eggs are wonderful! That is exactly what I wanted to do 3 years ago - I hand painted eggs for my daughters for the 1st Easter and I wanted to do it each Easter but I never got around to making the tree part. Ugh! I am sad that I never did it. What a beautiful job! I may have to get creative soon and finally do it. Question: How do you store your eggs so they do not get broken. All of the eggs I painted broke!!! The tree part is new each year----just some branches from a tree. I store most of the eggs in a plastic storage container for Christmas ornaments (if they are really delicate I put some tissue paper in the space). I have some also stored in egg cartons. Love it! Wow- it is beautiful..... And I love how big it is, what a statement! 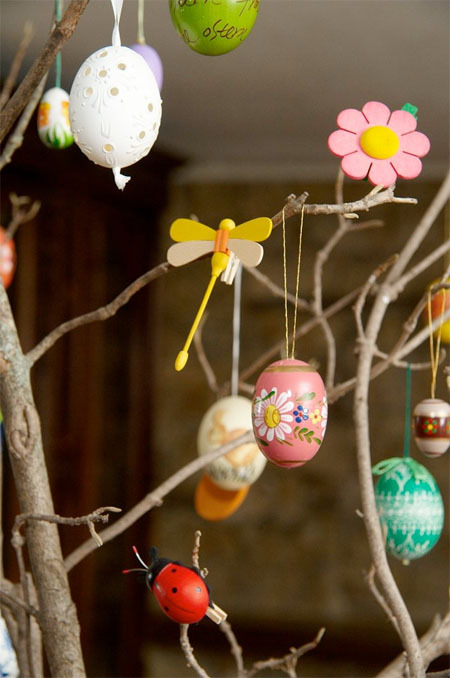 I also have an Easter tree that I adore! Mine is on a white tree but I love how yours looks so pretty! Maybe I'll have to try that next year! the eggs are beautiful...and i love the display.